One to 10 units per site, less than 5% enriched uranium, 4 years between refueling. The president will give $450 million to these rich multinationals like B&W, Bechtel. He will end up effectively giving away the similar amount to Solyndra alone ($385 million out of $535 million), so it's only fair, I suppose. Fukushima? What is that? How do you pronounce the word? President Obama, who may be keen to use corporate donations to fund his second inauguration ceremony in January, wants to spread the wonderful clean energy even to "small, remote areas that cannot support traditional reactors". Judging from the Oilprice.com's article below, it will be based on the technology for the nuclear reactors on board the US Navy's submarines and aircraft carriers. The Obama administration will fund 50% of the project to design and commercialize small, modular reactors, with the other 50% by Babcock & Wilcox, TVA, Bechtel International, and Mr. Bill Gates. I posted an article about Babcock & Wilcox in October. It's the company who "filed for Chapter 11 bankruptcy in part as a result of thousands of claims for personal injury due to prolonged exposure to asbestos and asbestos fibers (from Wiki). For Mr. Gates, to have inflicted buggy Microsoft products on the entire world for the past 20-plus years is clearly not enough. After the disastrous support for alternative energy companies and start-ups (like this one) that went belly-up after extracting large amounts of cheap loans from his administration, it seems Mr. Obama has decided it's safer to bet on the old, established multinationals. It's not his own money anyway. This week in energy, let’s go nuclear for a change. And let’s start with the Obama administration’s plans for a new generation of nuclear power. This time around things will be smaller and ostensibly safer. This new nuclear generation was given greater impetus on Tuesday when the administration announced it would fund up to 50% of the cost of a 5-year project to design and commercialize small, modular reactors. Who’s funding the other 50%? The project, which hopes to be operational by 2022, will be led by Babcock & Wilcox energy technology company of Charlotte, in partnership with the Tennessee Valley Authority and Bechtel International. And of course, we can’t forget Bill Gates, a key private investor. What is unique about the project is the small modular reactor design. They are about one-third the size of existing reactors. The technology used has already been implemented by the US Navy, but not commercialized. The administration is keen to point out that this new nuclear generation represents lower upfront costs, higher safety standards and greater flexibility—they can be used in small, remote areas that cannot support traditional reactors. They are assembled at a factory site and transported, ready to use, to their intended location. In terms of costs, these small modular reactors have a $250 million price tag, compared with as much as $9 billion for the typical large reactors currently built in the US. What will this new nuclear generation mean for consumers’ utility bills? Well, no one can say with any certainty just yet. Whether these new reactors would translate into cheaper electricity prices has not been definitively demonstrated, though it is of course an ultimate goal. Low natural gas prices are also a bit of a worry for the nuclear industry as a whole. While nuclear is experiencing a bit of a revival in the US and coal languishes in its death throes, globally, coal is enjoying gains. Some 1,200 new coal plants are in the works worldwide—the bulk of them in China and India—as countries take advantage of cheap coal prices in the US. But even Europe is importing increasing amounts of coal from the US. US coal exports have reached a decade high. For Europe, this is troubling. As the European public puts increasing pressure on governments to abandon any dreams of fracking shale gas reserves over environmental concerns, the energy gap is being filled in by more polluting coal. This is the subject of our special investor piece today. There is good news—and bad. While the European Parliament has rejected a fracking ban proposal, this doesn’t mean we’re about to see a shale gas free-for-all. Hurdles and pitfalls abound. Another developing trend that has caught our eye is what appears to be the declining attraction of Canada’s oil sands among US companies. A recent report put out by Peters & Co. energy investment bank of Calgary notes that there are some $17 billion in Canadian oil sands assets up for sale right now. The logic holds that US companies are trying to get out. The report points out that the $17 billion is the equivalent of assets sold throughout the past decade. Finally, amid all the hubbub of the International Energy Agency’s (IEA) dramatic report about the US overtaking Saudi Arabia as the world’s largest oil (oops, hydrocarbons) producer, we’ve missed something in that figure-manipulating report: A largely unnoticed blurb about California’s energy woes end with the information that the Monterrey Formation in Southern California has 15.4 billion barrels of recoverable crude oil. This puts Bakken (North Dakota) to shame. It’s four times the volume of Bakken. Anti-nuclear people in the US, it's your tax money that will fund these new nuclear reactors, whether you like it or not. Apple "solved" the Senkaku Islands row between Japan and China by showing two sets of islands, one for Japan and one for China, on iPhone5's ill-fated map (which also showed the USSR in Moscow, and London's Big Ben with different faces showing different times). Now it's Google's turn to show a mystery island on its Google Earth program. AFP reports that when Australian scientists went to look for an island that appears in Google Earth, there was no such island, and the ocean at that location is very deep (1,400 meter deep). In the age of digitized maps and navigation systems, it almost feels as if the real world should follow what's on the map and not the other way around; when it doesn't the problem is with the world, not the map. SYDNEY — A South Pacific island identified on Google Earth and world maps does not exist, according to Australian scientists who went searching for the mystery landmass during a geological expedition. The sizeable phantom island in the Coral Sea is shown as Sandy Island on Google Earth and Google maps and is supposedly midway between Australia and the French-governed New Caledonia. The Times Atlas of the World appears to identify it as Sable Island. Weather maps used by the Southern Surveyor, an Australian maritime research vessel, also say it exists, according to Dr Maria Seton. But when the Southern Surveyor, which was tasked with identifying fragments of the Australian continental crust submerged in the Coral Sea, steamed to where it was supposed to be, it was nowhere to be found. "We wanted to check it out because the navigation charts on board the ship showed a water depth of 1,400 metres (4,620 feet) in that area -- very deep," Seton, from the University of Sydney, told AFP after the 25-day voyage. "It's on Google Earth and other maps so we went to check and there was no island. We're really puzzled. It's quite bizarre. "How did it find its way onto the maps? We just don't know, but we plan to follow up and find out." News of the invisible island sparked debate on social media, with tweeter Charlie Loyd outpointing that Sandy Island is also on Yahoo Maps as well as Bing Maps "but it disappears up close". On www.abovetopsecret.com, discussions were robust with one poster claiming he had confirmed with the French hydrographic office that it was indeed a phantom island and was supposed to have been removed from charts in 1979. Another claimed: "Many mapmakers put in deliberate but unobtrusive and non-obvious 'mistakes' into their maps so that they can know when somebody steals the map data." Google was not immediately available for comment. But the Google Maps product manager for Australia and New Zealand told the Sydney Morning Herald a variety of authoritative public and commercial sources were used in building maps. "The world is a constantly changing place, and keeping on top of these changes is a never-ending endeavour," Nabil Naghdy told the newspaper. The closest landmass to the invisible island is the Chesterfields, a French archipelago of uninhabited coral sand cays. Here's Google Earth screenshot of "Sandy Island". I can understand the map may have the island, but on Google Earth? "Sandy Island" looks like a cut-out hole. At 3:08AM, the Aichi prefectural police made a daring rescue attempt which was successful. The police released the hostages and arrested the man, according to Chunichi Shinbun. Before he was finally arrested, he had gotten all he wanted - bento, drink, cigarettes, megaphone, flood light - except for one thing, obviously: resignation of the Noda cabinet. It will happen anyway, post-election, whether Mr. Noda is able to form a coalition or not. I thought it was a made-up story in one of the popular Japanese message boards, but it turns out to be real. I don't think I have ever heard of a Japanese hostage taking situation where the demand is the resignation of the cabinet. There was an emergency notification from Toyokawa Credit Union Zoshi Branch in Zoshi, Toyokawa City in Aichi Prefecture at about 2:20PM on November 22 to the Aichi Prefectural Police. According to the Police and the credit union, a man in his 30s or 40s has barricaded himself with a knife, and 5 people including bank employees and a customer have been taken hostage. They are a male deputy branch manager (41 years old), female employees aged 27 and 19, a female part-time worker aged 55, and one female customer. The branch is shuttered and one cannot see inside. To the policemen who have rushed to the scene, the man is demanding food and drink. He is also demanding the resignation of the Noda cabinet and the media coverage. FNN News says the man also wants a megaphone. While all Japanese media seem to have simply copied and pasted Toshiba's PR material and called it a "news article", AP actually reported what the reporter saw at a demonstration held in Yokohama on November 21, 2012. It can climb stairs, carry 20 kilograms of load. If it falls, it cannot get up by itself. Duh. AP's Ms. Kageyama correctly asks, "What exactly is the robot capable of doing?" YOKOHAMA, Japan — Toshiba Corp. has developed a robot it says can withstand high radiation to work in nuclear disasters, but it's not clear what exactly the robot is capable of doing if and when it gets the go-ahead to enter Japan's crippled Fukushima Dai-ichi nuclear plant. The four-legged robot can climb over debris and venture into radiated areas off-limits to humans. One significant innovation, Toshiba said, is that its wireless network can be controlled in high radiation, automatically seeking better transmission when reception becomes weak. But the machine, which looks like an ice cooler on wobbly metal legs, also appears prone to glitches. The robot took a jerky misstep during a demonstration to reporters, freezing with one leg up in the air. It had to be lifted by several people and rebooted. The robot was also notably slow in climbing a flight of eight steps, cautiously lifting its legs one by one, and taking about a minute to go up each step. With obstacles that aren't as even and predictable as steps, such as the debris at the Fukushima plant, it may need as much as 10 minutes to figure out how to clear the object, Toshiba acknowledged. And if it ever falls, it will not be able to get up on its own. Still, Tokyo Electric Power Co. said it might use the robot to inspect the suppression chamber of the nuclear plant where a devastating meltdown occurred after a mammoth tsunami slammed into northeastern Japan on March 11, 2011. Toshiba began developing the robot with hopes it would prove useful in helping to decommission the plant. No human has been able to enter the highly radiated chamber since the tsunami disaster. "We need this to go in and first check what is there," Toshiba Senior Manager Goro Yanase said Wednesday. It was unclear when a decision on the robot's use would be made, according to TEPCO, which operates the nuclear plant. Although what Toshiba showed was top-notch robotics, what the machine might be able to do appeared limited in the face of the disaster's magnitude and complexity. Japan boasts among the world's most sophisticated robotics technology, exemplified in the walking, talking human-shaped Asimo robot from Honda Motor Co. The inability of such gadgetry to help out with the Fukushima disaster was widely criticized. Part of the reason is that robots, although suited for tasks such as greeting visitors at dealerships, are too delicate. Their wireless remote-controlled networks are not designed to endure high radiation. Honda has acknowledged Asimo would not have been able to withstand the environment at Fukushima, as some had suggested. Toshiba's Yanase said the new robot, which has a dosimeter to measure radiation and six cameras, can stay in a 100 millisievert environment for about a year and can tolerate even higher radiated areas for shorter periods. At 100 millisieverts, the rise in cancer cases caused by radiation becomes statistically detectable, although even lower dose radiation is not advisable for people. 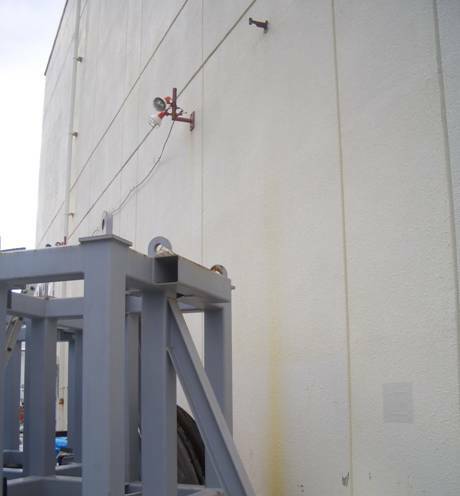 The suppression chamber was 360 millisieverts the last time it was measured, TEPCO said. 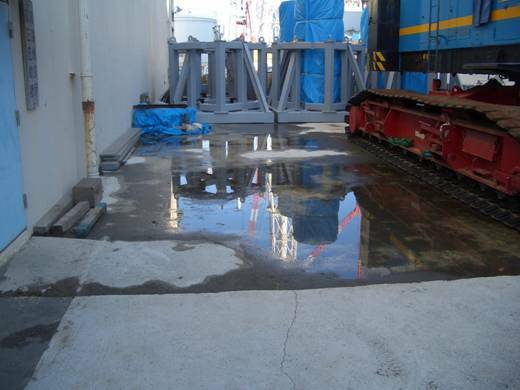 Decommissioning Fukushima Dai-ichi is expected to take decades. Reading the Sankei article, Toshiba seems to be pressuring TEPCO to take its robot and use it (somehow) at Fukushima I Nuclear Power Plant, as Toshiba expands its portfolio of post-nuclear-disaster technologies that includes gamma-ray camera, SARRY, and the new multi-nuclide decontamination facility (ALPS). Why does a robot have to be a hunky gadget loaded with stuff and why does it need to climb stairs to begin with? A host of tiny, self-organizing and collaborating drones still gets my vote. The cause of the leak seems to be elementary (yet again). They had a plug in the drain line, so the contaminated water that should have gone to the drain line went up and out of the vent line instead. Fukushima I Nuke Plant is entering the second winter since the nuclear accident, and many, many more winters to come until the plant is decommissioned. Well beyond the attention span of most Japanese. French Officials Accuse US of Hacking Sarkozy's Computers, Attacks Bear Hallmarks of "Flame"
The United States used U.S.-Israeli spy software to hack into the French presidential office earlier this year, the French cyberwarfare agency has concluded, according to the newsmagazine l'Express. The magazine reported late Tuesday that the computers of several close advisers to then-president Nicolas Sarkozy – including Chief of Staff Xavier Musca – were compromised in May by a computer virus that bears the hallmarks of Flame, which was allegedly created by a U.S.-Israeli team to target Iran's nuclear program. Anonymous French officials pointed the finger at the United States. “You can be on very good terms with a 'friendly' country and still want to guarantee their unwavering support – especially during a transition period,” an official told the magazine. The alleged spying attack took place a few days before the second round of the French presidential elections, which Sarkozy lost to Francois Hollande, a socialist. Homeland Security Secretary Janet Napolitano reportedly did not deny the allegations when asked point-blank about them. The White House did not return a request for comment from The Hill. I remember there was a little noted piece of news earlier this month that the oil giant Chevron admitted that their system was infected with Stuxnet. Stuxnet, the sophisticated computer virus that attacked a nuclear enrichment facility in Iran two years ago, also inadvertently infected Chevron's network. Reportedly created by the U.S. and Israel, the highly destructive worm was designed to infect Iran's Natanz nuclear facility. Rather than steal data, Stuxnet left a back door meant to be accessed remotely to allow outsiders to stealthily knock the facility offline and at least temporarily cripple Iran's nuclear program. The oil giant discovered the malware in July 2010 after the virus escaped from its intended target, Mark Koelmel, Chevron's general manager of the earth sciences department, told The Wall Street Journal. "I don't think the U.S. government even realized how far it had spread," he said. "I think the downside of what they did is going to be far worse than what they actually accomplished." A Chevron spokesperson told CNET that the company's network was not adversely affected by the virus. "Two years ago, our security systems identified the Stuxnet virus. We immediately addressed the issue without incident," a Chevron representative said. The two pieces of malware -- Flame for reconnaissance, Stuxnet for attack -- each included a module that appears to originate from the same source code, likely written by a single programmer. Persistent comments that Fukushima I Nuke Plant was infected by Stuxnet don't seem to take into account, though, that their network system hadn't been quite brought up to speed in the PC era, not advanced enough to get infected. #Radioactive Japan: A Small Victory in Osaka City? Disaster Debris Test Burn on November 24 Halted? The boy-wonder mayor of Osaka City, having absorbed Shintaro Ishihara's Taiyo (Sun) Party and no doubt absorbed the subsidy money for the political parties in Japan (it's a generous subsidy from the national government, funded by taxpayers, 250 yen per citizen every year), was just going to declare the end of the City Assembly session today (November 20, 2012) so that he can focus on the national election. But on the last day of the session, a meeting of the Public Welfare and Health Committee was held, and an assemblywoman from Liberal Democratic Party submitted a motion to suspend the test burn of disaster debris from Iwate and continue to study the health effect from the debris burning. The motion passed, quite unexpectedly. So, people who have tirelessly been campaigning on-and off-line against the debris burn in their city (for that matter, they've been against any city, calling the bureaucrats and officials everywhere and visiting them to talk in person) and have almost given up because of the boy-wonder just does what he wants, are stunned. It's still unclear what will happen next. It seems LDP of Osaka City is saying the burn will be stopped, but Komei Party is not so sure and says if the mayor wants to do it he will just do it. As far as they know, and I can gather, the test burn may be put on hold until January at least. I wonder what will happen to the container ship on route from Iwate to Osaka. By the way, the boy-wonder mayor, after having a haircut that shows his forehead to fit in with the Ishihara's group, now looks like just a tired middle-aged man. He's campaigning for his party, while remaining as the mayor of Osaka City. "Try us once, to run this nation of Japan." Hear that, Japanese politicians? You're behind the curve again. Instead of voting each time to issue another batch of bills, notes and bonds for further deficit spending like you just did, you could simply get rid of the restrictions to issue debt. Geithner's Debt 4Eva will go together wonderfully with Ben "Blackhawk" Bernanke's Quantitative Easing 4Eva. ...Geithner said in the interview the debt ceiling should be eliminated, and “the sooner the better.” Without an increase in the ceiling, the government may not be able to pay all of its bills and risks defaulting on its debt. Congress and the Obama administration debated the limit for months last year before reaching an 11th-hour agreement in August 2011. Geithner said he agreed with Michael Duke, chief executive officer of Wal-Mart Stores Inc. (WMT), that consumers need a quick agreement on the fiscal cliff. “The uncertainty right now about whether this will be resolved on sensible terms, whether our middle-class families will see their taxes go up, already is having an effect on consumer confidence and the economy,” he said. Let's see, the government's so-called solution to "solving" the fiscal cliff is mostly about which consumer group to tax further and by how much. According to Geithner and the Wal-Mart CEO, as soon as the consumers know for sure they will be taxed heavily, they will start spending. Makes sense. Meanwhile, one of the past Nobel Prize winners in economics is promoting his wonderful idea of bringing back 91% tax rate. Move over, Monsieur Hollande (whose proposal is to tax the "rich" at 75%). People like Dr. Krugman or Mr. Warren Buffet (who also begs the government to tax him) have an option to contribute to reducing the government debt without involving others. They could simply contribute their money to the Treasury Department. The Treasury Department says you can even use your credit card, and do it online at Pay.gov. You get to incur further personal debt in order to save the federal government. Makes sense.